Guys, when I heard what happened at Fyre Festival, chills went down my spine. For real. If you’re not well versed on the festival scene I’ll bring you up to speed. Weekends filled with unlimited partying, too little sleep, continuous music and more people than I’d ever be comfortable around, are all the rave right now. Hundreds of thousands of millennials are flocking to events like Coachella, Stagecoach, Sunfest, Bonnaroo, Warped Tour, etc. to catch a glimpse of their favorite artists — and they’re dishing out thousands to do it. Last winter rapper Ja Rule and tech entrepreneur Billy McFarland decided they wanted in on the action and conceptualized Fyre Festival, an opulent music weekend in the Bahamas with “first-class culinary experiences and a luxury atmosphere.” If Paul Tollett can do it, surely Ja Rule can – right? Without skipping a beat marketers and advertising agencies were put on the payroll and tasked with landing endorsements from models, reality TV celebs, etc. And, they did their job, maybe a little too well. It wasn’t long before THOUSANDS of party-goers purchased their $1,500+ tickets for the weekend. I can’t even say I blame them, the promo video looks legit. In a horrifying twist of events, party-goers showed up in the Bahamas on April 27th to a scene that has been described as the Hunger Games. Luxurious accommodations turned out to be a flooded tent village with wet mattresses and no security. 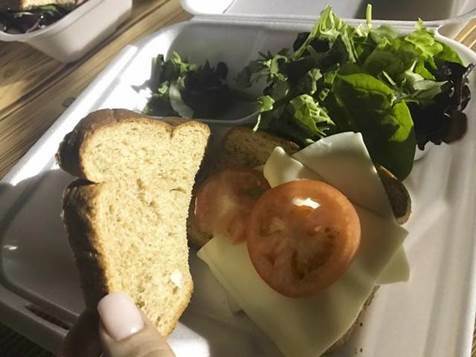 First-class culinary experiences equated to take-out containers of cheese sandwiches and wilted lettuce. Oh, and not a single celebrity or artist showed up. Can you even imagine?! The truly horrifying part, everyone was trapped because they were on a secluded island with no taxis back to the airport. Needless to say lawsuits are plentiful in the lives of Rule and McFarland right now and rightfully so. This is truly my worst nightmare and an eye-opening example of social influencers’ control over consumers. The lesson, ladies and gents? Never, ever sign up for a weekend hosted by Murder Inc.’s feature artist. At least 50 cent appears to be enjoying all the attention Rule is getting.